I came too slowly, realising that I was not alone in the bed. Mmmm… It has been a long time since I awoke to having my face stroked. 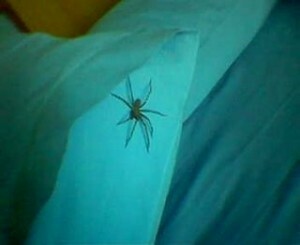 I opened my eyes and there he was scurrying away from me, surely I don’t look that bad when I first wake in the morning? Now wait a minute, you don’t fondle me in my own bed and then make a run for it. I want evidence! Where is the camera when you need it? Right young man, come out from your hiding place and face the music. Got you, a real beauty! Do you think I should tell my daughter? This entry was posted in Family, Fun and tagged Family, Fun, spiders on September 22, 2006 by Grannymar.